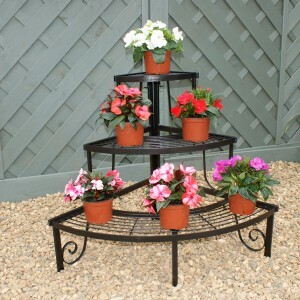 The 3 Tier Corner Stand by Poppy Forge is an ornate plant stand, designed and made in the UK. It is constructed to fit perfectly in corners and is an all steel construction. It is coated in antique black polyester paint to ensure it is protected from weathering and rust. It is unique in its design and is sure to add height and interest to your garden, whilst raising your plants, flowers and herbs off the ground. This will make gardening easier for the gardener. It stands at 30” high. Height - 77cm / 30"
Depth - 64cm / 25"